Art from Y The Last Man. After years of waiting to see Yorick, 355, and Ampersand wander through a landscape without dudes, fans might finally get a chance to see the classic comic book series adapted for the screen. Y: The Last Man is finally getting a pilot. Variety is reporting that FX, already home to Marvel’s Legion, has ordered a pilot based on the Brian K. Vaughan/Pia Guerra series that was published under DC Comics’ Vertigo imprint. Michael Green (American Gods, Logan) and Aida Mashaka Croal (Luke Cage) are attached as executive producers/showrunners, and will be working with Vaughan, who’s done TV work on shows like Lost and Under the Dome. 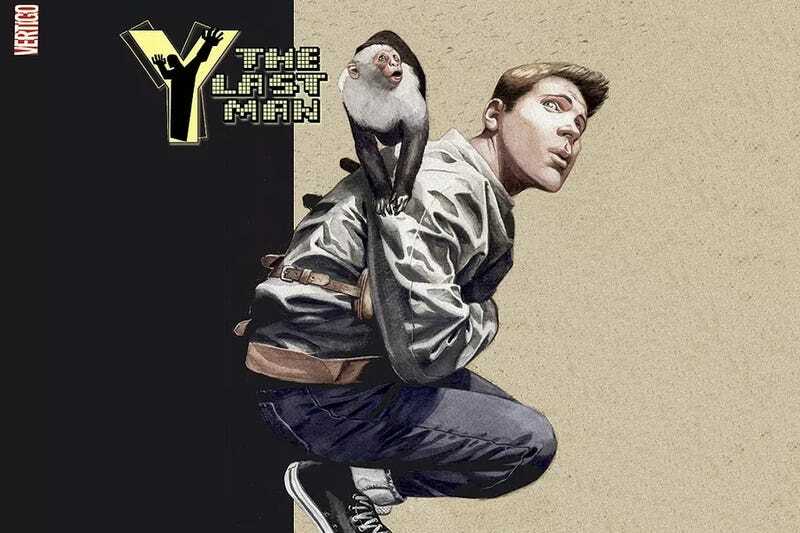 Y: The Last Man ran for five years and told the story of Yorick Brown, who wakes up as humanity’s last surviving male after a mysterious plague wipes out every other male lifeform, except his pet monkey, Ampersand. There’s no on-screen talent attached to the project yet, but Melina Matsoukas (Insecure, Master of None, Beyonce: Formation) will direct the pilot. A project like this will almost certainly attract high-profile female talent from all over Hollywood and beyond. Y: The Last Man Is Finally Heading to TV!